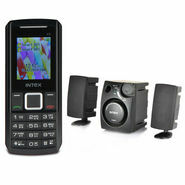 Intex has been popular for providing top class computer hardware in the electronic industry. Now, the brand has started its manufacturing business even in the mobile gadget field also. Naturally, the brand is already on its toes to strengthen its niche in this field. Despite of being a novice in this sector, the brand has successfully launched a whole slew of stylish and smartly built phones. Strong and sturdy chassis of the handsets complement the easy-to-carry handling and thus win over the mobile users heart. There is hardly any appealing feature left that is not there in an Intex Mobile. Brilliant and useful aspects of these handsets are rolling many eyeballs to be very precise! Innovative machinery, advanced tools and technology, steady performance - these all are the specialties of the Intex mobile phones. The dual sim calling facility will get you rid off two different mobiles and will keep you in touch of every single contact you have. With perfect clarity and brightness, now you can do live video chatting via the superb webcams embedded upon these handsets. Intex has answer for every kind of gadget taste, starting from long life battery and utility mobiles to Universal remote control and gaming mobiles. 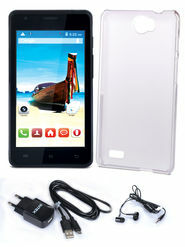 The smart phones of the brand are truly reliable and user-friendly. GSM and CDMA networks both do the right job after clubbing with these handsets, MP3 Player, torch, FM radio, giant memory space- take the most out of the handsets with such useful features. Easy data sharing and transferring will keep you active even on the go! On the rear part, these palm sized gizmos are perfectly equipped with high in caliber snappers with amazing imaging power. So, be it multimedia or connectivity- you can have the most exciting and adventurous mobile computing experience that is simply beyond your expectations!